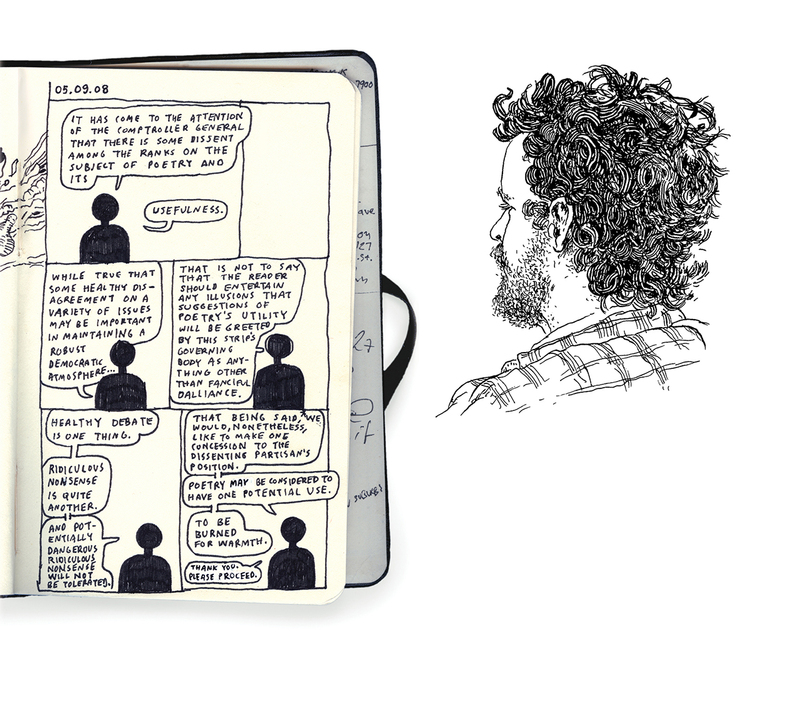 Why does one publish a sketchbook? What unmoored narratives does an artist allow to be revealed, and what obligation does she have to collect her thoughts cohesively? Art Spiegelman was tortured by the idea of publishing, faithfully, his sketchbook pages (he did so anyway, in 2009’s Be a Nose! ), as he felt them unfinished; other comics artists have similarly felt pressured to conjure up polished books originally intended for private archives. 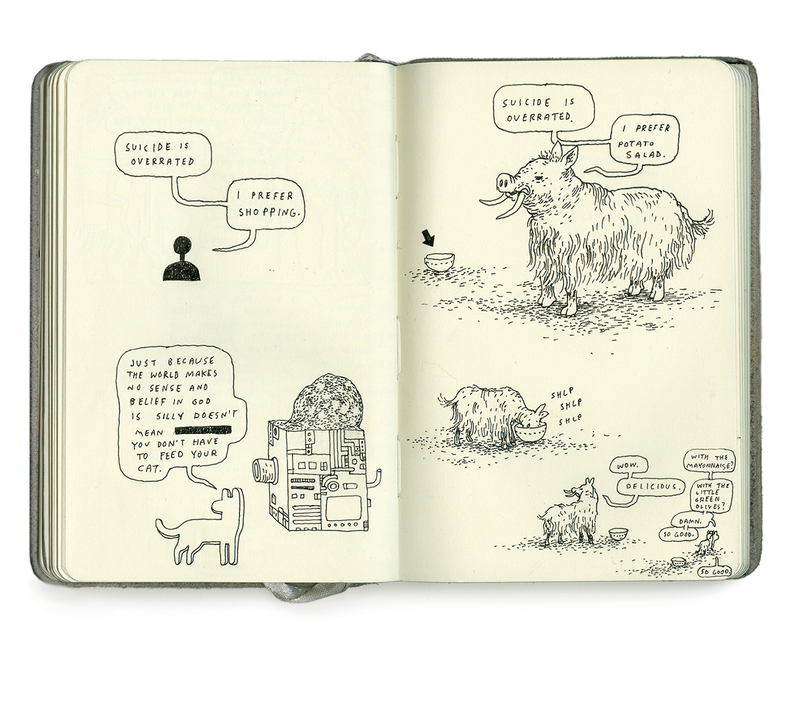 In Poetry is Useless, Anders Nilsen’s latest offering, published by Drawn & Quarterly, the sketchbook is presented not simply as a compendium of works in progress but also as a vehicle for telling stories. 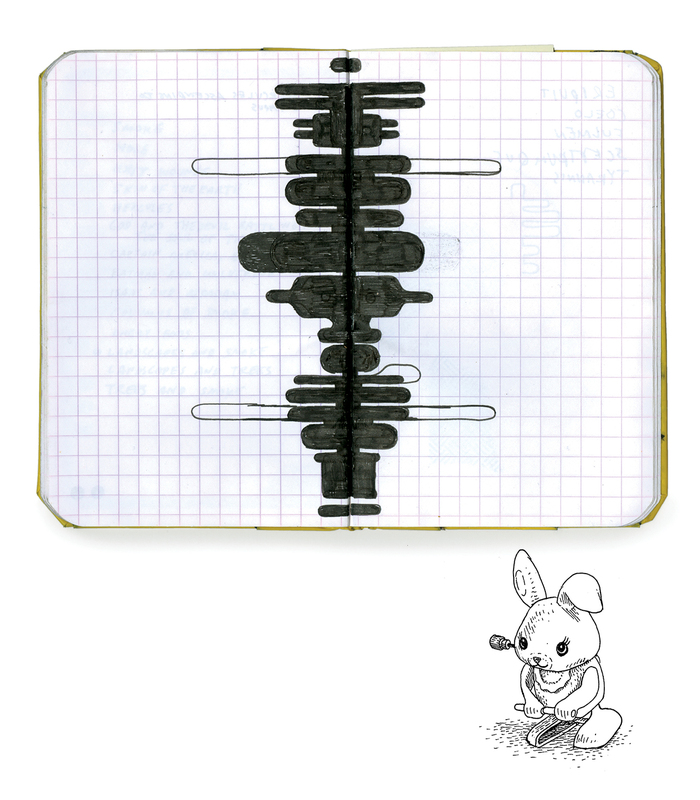 Here, Nilsen deconstructs spatial and conceptual demarcations by starting with scans of his journals — the edges, saddle stitches, and ribbon bookmarks visible — and then drawing on top of and around them; in this way, the sketchbook pages become almost like traditional comics panels, from which doodles and words climb out into the actual book. It’s rather difficult to read, but not impossible — Poetry is Useless should be absorbed over a long period of time, and not necessarily tackled as a chronological book. 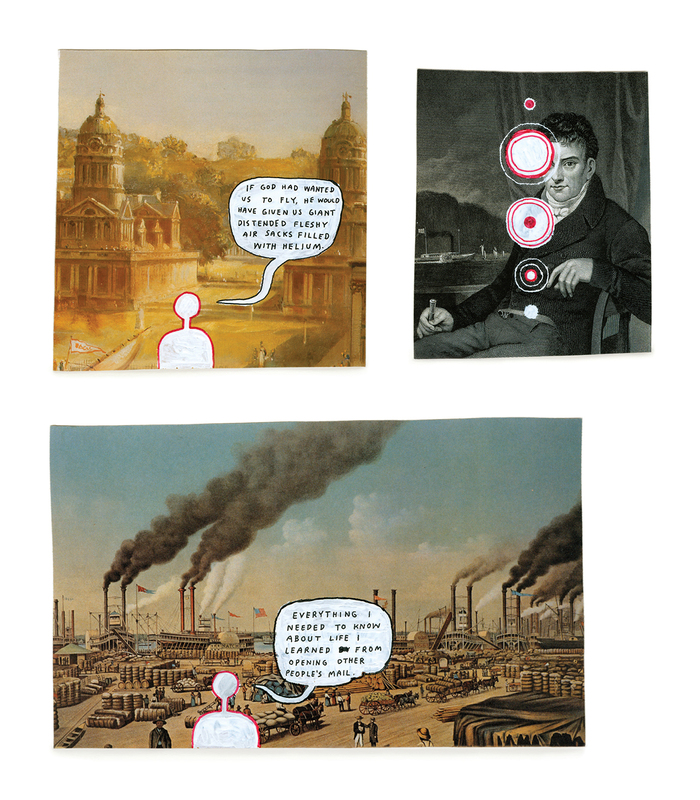 The switches between comic strip and illustration, as well as text-inundated page and wordless story, take a while to get used to, especially since you get the feeling that there are deliberate messages Nilsen wants to convey. His observations on life hum with humor and brio; in the same deadpan tones he’s previously assigned to anthropomorphized birds (in Big Questions) and apathetic gods (in Rage of Poseidon), Nilsen theorizes about art, nihilism, relationships, politics, and love. These fragmented thoughts are interspersed with lists and, infrequently, complete comic strips. For example, a double-page sketchbook spread on page 137 shows, on the left, a silhouette icon saying “Suicide is overrated; I prefer shopping.” Opposite, a wooly tusked boar responds: “Suicide is overrated; I prefer potato salad.” Said boar then eats a bowl of potato salad. Absurd? Absolutely. But the juxtaposition of these words with Nilsen’s delicate stippling and sketching is funny and true, remindering us of the way topics such as death and suicide are sometimes discussed in a blasé manner. This satirical (and cynical) subversion continues throughout the book as a conflicted commentary on human interaction and how desensitized we’ve become. Once I stopped forcing myself to read the book chronologically, I began to notice certain anchors or recurrent motifs that add body to Poetry’s structure. The most consistent character is Nilsen’s semi-autobiographical silhouette icon, a snarky voice of reason constantly reminding us that poetry is useless. “It’ll help us if we just get it out of the way,” he says in the introduction, and then later: “It’s just another way the ruling class maintains its animal Oppenheimer cow’s milk.” Sometimes there are clusters of themed images: over pages 26–39, Nilsen gathers his detailed drawings of vintage toys such as McDonald’s Hamburglar in his getaway car, Mickey Mouse, and a wind-up bunny; the characters are instantly recognizable without any labels, evoking childhood nostalgia. Then there are direct observational sketches from described times and places: profiles at an Easter vigil service in March 2012, a portrait of a woman he met on a train from Zurich to Lucerne in 2013. There is something quite removed about these time-stamped drawings, which record moments but little concrete information about their subjects. Whereas Nilsen’s award-winning Big Questions (2011) could be criticized for being too minimal, too abstracted from human sentience, Poetry deliberately veers towards a discussion of intimacy and what we, as a society, make of our daily human interactions with each other. For example, in one especially compelling strip, Nilsen meets a fan after a book signing who confesses that he has the exact same name. In the course of their conversation, it’s revealed that the fan’s wife’s also shares a name with Nilsen’s former fiancée, who died of Hodgkin’s disease and is the subject of his 2006 book Don’t Go Where I Can’t Follow. One of the rare comic strips here that’s actually complete, the anecdote tussles with the uncomfortable coincidences of life — “with a few details changed, you’re actually telling other people their own stories, just before they happen” — and loss. While it’s interesting to see how an idea in Nilsen’s head makes its way onto the page — he ekes out an image or character over and over again across the book before it’s right — vignettes like this one ultimate make Poetry a larger story about connection and disconnection, one that consciously weaves in and out of the scribbles. 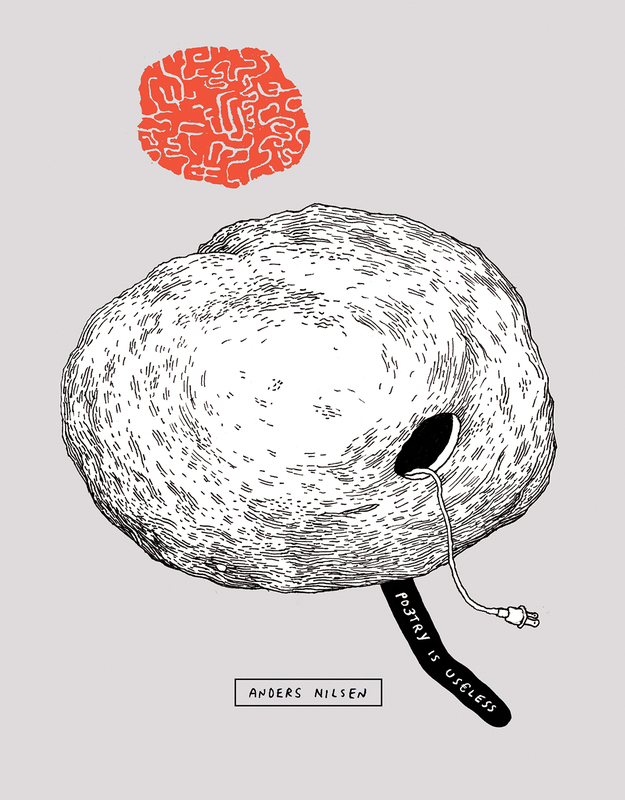 Anders Nilsen’s Poetry is Useless, published by Drawn & Quarterly, is available from Amazon and other online booksellers.